We are proud to welcome Greg Swift to Delmar as our new Head Chef. 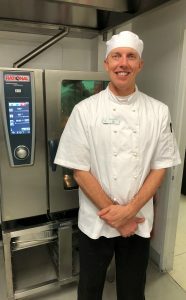 Greg has an extensive background in the hospitality and the food service sector, including working at The Sheraton Hotel Noosa and Season’s restaurant. Greg brings a fresh and energetic approach Delmar. His passion for great food and excellent service provides self-satisfaction and motivation to achieve. Greg has a hands on approach providing superior patient service and working in a productive team environment that leads to successful outcomes. Working at Delmar Private Hospital and living locally provides a great work/life balance. Please feel free to introduce yourself to Greg, he and the catering team will be happy to assist with any catering and dietary requirements that you may need.